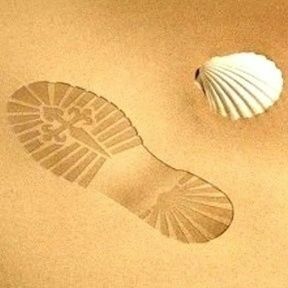 These really pretty and delicate scallop shells (concha de vieira) represent the symbol of the Camino de Santiago. The 1,000-year-old route to the great Cathedral city of Santiago de Compostela is known as the Way of St. James (El Camino de Santiago - in Spanish), and it is a renowned journey and adventure, as well as being a pilgrimage for some people of the Christian faith. If you want to wish your friends or colleagues well and show them how much you care (especially for someone travelling), let us send this meaningful present on your behalf. It is the ideal gift for any special event / occasion, particularly for someone starting out on a new adventure in life - like a new job, travelling afar or even beginning retirement. Dimensions: These beautiful little 14ct gold-filled Camino earrings feature a double scallop shell which measures 17mm in length (including the hanging ring) by 12mm in width. They hang on 14ct gold-filled 14mm earwires. But, whatever somebody’s journey - whether on El Camino itself, on holiday, a business trip, a gap year, trekking, etc, many friends and loved-ones like to pass on a special gift to wish the recipient well on their travels - and safekeeping along the way. These earrings are perfect for that purpose. In addition to any value that the Camino charm symbol has in itself, or the religious faith that it might represent, these earrings can also act as a reminder to be careful when travelling. And this can be a powerful aid to staying safe whilst away from home. Would make a perfect farewell gift. 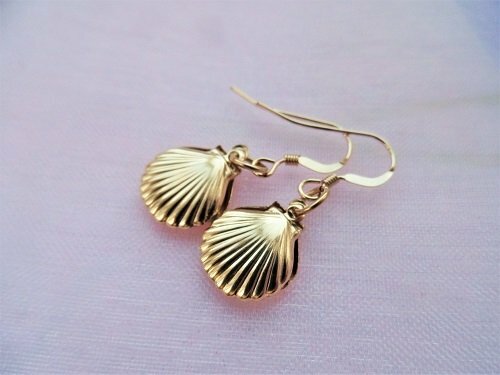 Gift these pretty scallop shell earrings to tell your friends and loved-ones that you are thinking of them or that you'll miss them, and to take care . . it's a really meaningful gift. Comes gift-wrapped, like all our presents - and we can print a personal message on your behalf.